Welcome to the second year of "Gotta do THIS," a monthly post filled with cool ideas of things to do in Southern Alberta surrounding Calgary, my home base. Each month I provide road trip suggestions as well to cover the entire Canadian Rockies across Alberta and British Columbia. Copied over from the March edition of "Gotta do THIS," Prairie Mountain is our annual "first summit" that we tackle each spring as we train up for bigger things. It's safe, there's no avalanche danger, and you don't risk falling off a narrow ridge at any point on the hike. Last year we only needed spikes at the very top before hitting the ridge but in previous years, we've worn spikes or ice cleats most of the hike. Play it safe, bring some kind of traction device for your hiking boots and choose a nice sunny day. An annual favourite activity of ours in April, save this trip for later in the month to guarantee a snow-free experience. Highway 66 past Elbow Falls is vehicle free until May 15th. Seize the opportunity to ride a wide open highway with no cars to worry about. We like to bike from the closed gate above Elbow Falls to the Beaver Flats Campground. We bike down into the campground (go left into the campground) and we head to the Beaver Flats Trailhead. From here we hike to the beaver pond to play and look for water bugs. Expect some mud but the trail is usually snow free in April. While biking (or driving) to Wayne, you will cross 11 one-lane bridges on this scenic country road. The ride is short if you want to bring your bikes and is approximately 10 km return. The stop at the saloon breaks the trip up and it's an extremely pleasant outing. You will be sharing the road with vehicles and motor bikes. Make sure your children know to stay to the right side of the road. We found most vehicles and bikers to be very respectful of us and most let us cross the bridges first before passing. Overall, we found this to be an incredible experience biking through the badlands to a ghost town and we'd do the trip again. For a "safer" and more "family-friendly" biking experience with young children in Drumheller, I recommend biking the paved river parks trail system to the Royal Tyrell Museum. We started from McMullen Island Park but you could also start right downtown by the big dinosaur and the Visitor Centre. While the paved riverside trail was generally easy, there is one long hilly stretch leading up to the museum that younger kids may have to walk. I'd also strongly advise sending adults down the hill first on the return ride. There's one blind corner and if you're going too fast, you could easily collide with people walking or riding up. Other than this section though, the ride is relatively flat and you can start your ride downtown by the giant dinosaur if you want to ride further. Our shortened trip from outside the town core was only 6 km return at most. 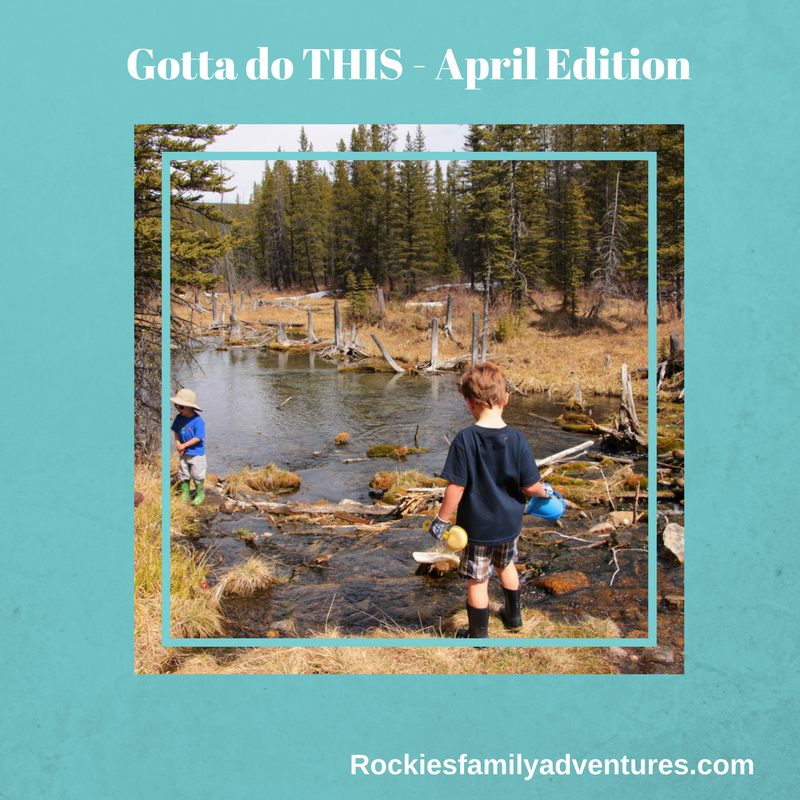 My top pick for the month of April would be the Many Springs Trail in Bow Valley Provincial Park combined with an easy bike ride from the Middle Lake Day Use Area. The whole campground is currently closed past Middle Lake until April 28th so you'll enjoy riding the roads without cars on them. You can stop at the playground in the group campground en route to Many Springs as well and have a picnic lunch here. My top pick for a spring getaway in April is the Columbia Valley (Radium Hot Springs or Invermere) in BC. It's a close drive for a weekend away and you'll find green grass, mountain bike trails that are good to go without mud or snow, and no shortage of things to do from hiking to swimming in hot spring pools. Willow Rock Campground - Bow Valley Provincial Park. This is the access point for the Flowing Waters hike and is right across the road from the main Bow Valley Campground for biking/hiking the Many Springs Trail. And don't worry if you only see the RV part of the campground at first. There are lovely spots in the trees down below. No reservations are required to camp here so just show up if you want to head out on a nice weekend. The campground opens for the season on April 1st. Now is a great time to enjoy a final day at Nakiska with those family passes you might have. The ski hill is still open and will be through most of April. 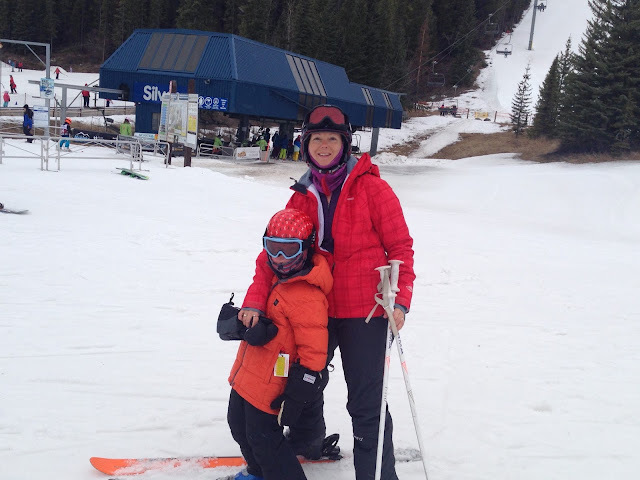 And find out about Nakiska's Spring Fiesta Weekends in my newest story: Ten Tips for AWESOME Spring Skiing - Nakiska Ski Resort. Spring is one of my favourite times to explore the Icefields Parkway where there's still snow well into April for skiing, snowshoeing, and playing. By staying overnight in hostels along the Icefields Parkway, we have discovered secret canyons, ice caves, frozen waterfalls, magical creeks, and winter wonderland post card photos around each corner. Below are some stories I've written about our adventures along the Icefields Parkway. And, I did check to see if there was still space in any of the hostels along the parkway. Both Rampart Creek and Mosquito Creek have available beds on weekends in April. Hilda Creek is full on weekends, but you would definitely be able to find space mid-week. Happy April, Happy Spring, and Happy Adventures!